The National Institutes of Health has awarded a $6.4 million grant to the University of Delawares Center for Biomedical Engineering Research to study osteoarthritis, with specific focus on the healing of cartilage and projects involving the knee. This is the second significant grant in the last two years that NIH has awarded the University through its Center of Biomedical Research Excellence (COBRE) program. In 2001, NIH awarded UD a $6.8 million grant to establish a center of excellence in the area of structural and functional genomics. Both grants are funded over five-year periods. The goal of the grant to the osteoarthritis center is to create infrastructure and expertise to address the mechanisms of osteoarthritis and its prevention and treatment, according to Thomas S. Buchanan, UD associate professor of mechanical engineering. 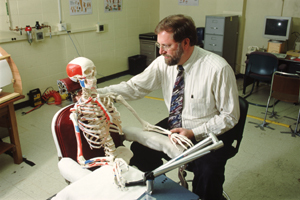 He co-directs the project with Stuart Binder-Macleod, professor of physical therapy and department chairperson. Researchers will be drawn from the Department of Mechanical Engineering in the College of Engineering, the departments of Physical Therapy and Biological Sciences in the College of Arts and Science and the Department of Health and Exercise Science in the College of Health and Nursing Sciences. Buchanan said the grant will fund research projects in four areas: the healing of cartilage, a biomechanical analysis of the osteoarthritic knee, the effect of in-shoe wedges on the osteoarthritic knee and the impact of knee alignment on the progression of osteoarthritis. The four teams will match junior researchers, who are the primary target of the COBRE program, with veteran faculty, Buchanan said. The healing of cartilage will be examined by principal investigator John E. Novotny, assistant professor of mechanial engineering, and by investigators Mary. C. Farach-Carson, professor of biological sciences, and Andras Szeri, R.L. Spencer Professor of Mechanical Engineering. This project will study osteoarthritis at the genetic level, looking at changes in tissue composition and cellular regulation during the healing process. Principal investigator Kurt T. Manal, a postdoctoral fellow in mechanical engineering, will lead a team that will make a biomechanical analysis of the arthritic knee. He will be joined in this project by Buchanan and by Dr. Michael J. Axe, an orthopedic surgeon and clinical professor of physical therapy. They will use a biomechanical model based on magnetic resonance imaging (MRI) and electromyography to examine the knee during the activities of daily life. Models developed could enable scientists and clinicians to undertake virtual surgery and thereby assess the results that could be expected as a result of surgical interventions for various problems related to osteoarthritis of the knee. The impact of in-shoe wedges on osteoarthritis of the knee will be considered by principal investigator Todd D. Royer, assistant professor of health and exercise sciences, and investigator Irene S. McClay, associate professor of physical therapy. Wedges have been shown to be an effective approach to reducing pain in patients with osteoarthritis, but the mechanism responsible for the reduction in pain is not well understood. This project will examine the effects of wedges on static alignment measures and lower extremity mechanics. The fourth project will look at knee alignment and the progression of osteoarthritis, with particular attention to the effects of bowleggedness. Principal investigator Katherine S. Rudolph, assistant professor of physical therapy, will work with Lynn Snyder-Mackler, associate professor of physical therapy. Buchanan has a longstanding interest in arthritis and has received funding from the Arthritis Foundation for his work. As a mechanical engineer, he said his interest comes naturally because osteoarthritis often results as a mechanical malfunction of the body. The NIH Centers of Biomedical Research Excellence grants are designed to build research infrastructure to enhance an institutions research capacity and competitiveness for additional NIH grants. Supported by the National Center for Research Resources Division of Research Infrastructure, these awards provide five years of funding for multidisciplinary teams to develop faculty biomedical research expertise and competitiveness within a thematic research focus of their choosing.